Honda Amaze has proved to be a very successful venture for the company. It was launched around 2 years back and has already booked orders for 22,000 car units for sale in India. Now, Honda is planning to launch Honda Amaze in Nepal. The car will be manufactured in India and distributed by Syakar Trading Company. 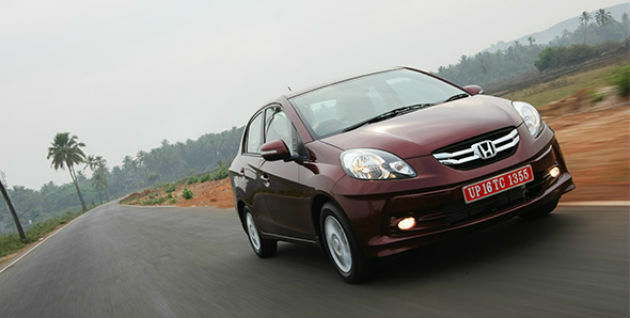 Honda launched Amaze in India as the petrol variant. To keep up with the Indian requirements it had to bring out a diesel variant as well. The car got a terrific response from the Indian customers. The petrol variant offered a displacement of 1200 cc while the diesel variant offered 1500cc. It was available in 3 variants namely- Amaze SMT, EMT and EXMT all offering manual transmission. For its launch in Nepal, Honda is offering similar specifications. The car has a 4 cylinder engine with a capacity of 1.2 litres. Only the petrol variant will enter Nepal. The SOHC iVTEC engine produces a power of 87 bhp and a maximum torque of 107 Nm at 6000 rpm and 4500 rpm respectively. The car is highly fuel efficient with an average of 18 km/litre. It has a boot space of 400 litres. The car will be available in 6 exciting colours which are pearl red, urban titanic metallic, crystal black pearl, majestic blue, alabaster silver metallic and carnelian. Only manual transmission will be available as if now, although it is expected that the automatic transmission variant will be launched soon. Honda Amaze will be competing with established brands like Maruti Suzuki Dzire and Ford Fiesta Classic. After the success it has seen in India, it is expected that this Nepali launch will also be a great venture for Honda.